Where do sponsored ads appear on Amazon? Does Amazon PPC influence organic rankings? How do I make money from Amazon PPC? How much does it cost to advertise on Amazon? 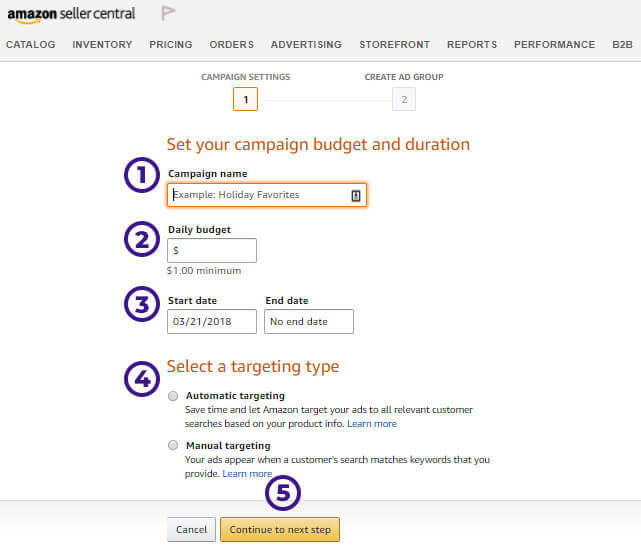 Amazon PPC strategy: how to start an Amazon ad campaign. Some of this stuff may already be familiar with some of you. For those of you just starting out, we also recommend that you read the article on branding and packaging that Dave wrote last week. 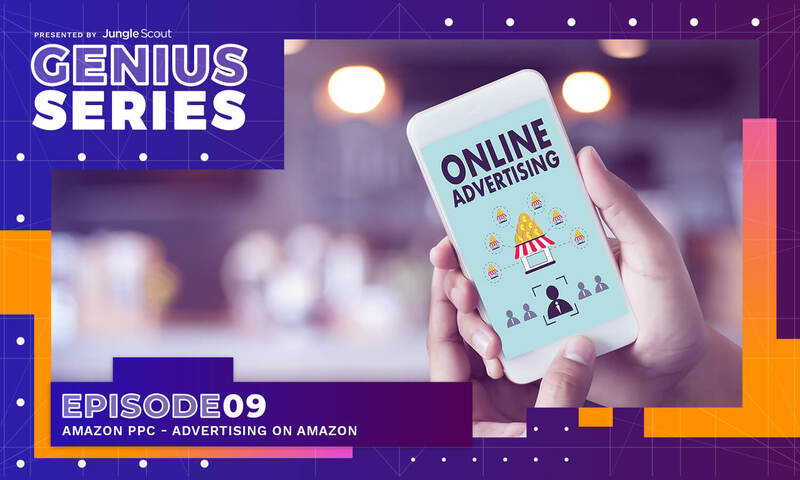 Often called sponsored ads, Amazon ads are advertisements found within Amazon’s search engine results pages and product pages which are paid for third-party sellers. Third-party sellers can establish these ads through Amazon seller central and pay for them through a program known as Amazon PPC. Need a primer on the BEST way to make money online? Here’s a free video and guide that can help: How do I make money from Amazon? Amazon sponsored ads use a method called pay-per-click (PPC). Pay-per-click is an advertising method wherein the advertiser only pays for the ad once a potential shopper clicks on the ad to view their product. This method is also called CPC. PPC works differently than pay-per-mil advertising PPM, which is an impressions-based method of advertising like Facebook uses. With PPM, the advertiser pays for every 1,000 people who see the ad, versus those who click on the ads. Where do Sponsored Product ads appear on Amazon? Headlines. Additionally, branded products on Amazon that have three or more products in their catalog can purchase headline ads. These ads often appear at the top of the SERP and give the advertiser the ability to write a little advertising copy to promote the represented products. Product pages. Advertisements even appear on product pages in a few different areas. In the desktop view, just below the fold there is a band of products with the heading “sponsored products related to this item.” This band appears again above the reviews and product FAQ. Off-site marketing. Amazon also advertises just like anyone else, and one way they’ve found to be effective is advertising products that you might be interested in. You’ve probably seen it before, too. You’re on a website that you like and you notice a product that you were looking at recently, or something related. Those are ads targeting you specifically. Email newsletters. Like anyone else, Amazon also does a lot of email marketing. Sometimes, in their newsletter they’ll throw in a few targeted products, too. Amazon’s always changing things up and testing new channels, too. So don’t be surprised if you see your ads in other places. The more Amazon can promote your product, the better, right? Advertising on Amazon is the best way to get your product in front of more people. Remember, there’s millions and millions of products available on Amazon. And even if you’ve done your job and picked the perfect high-demand/low-competition product to sell on Amazon, you still have to let the world know about it. Otherwise, it’s going to sit 3 or 4 pages deep in the SERP and you don’t want that. 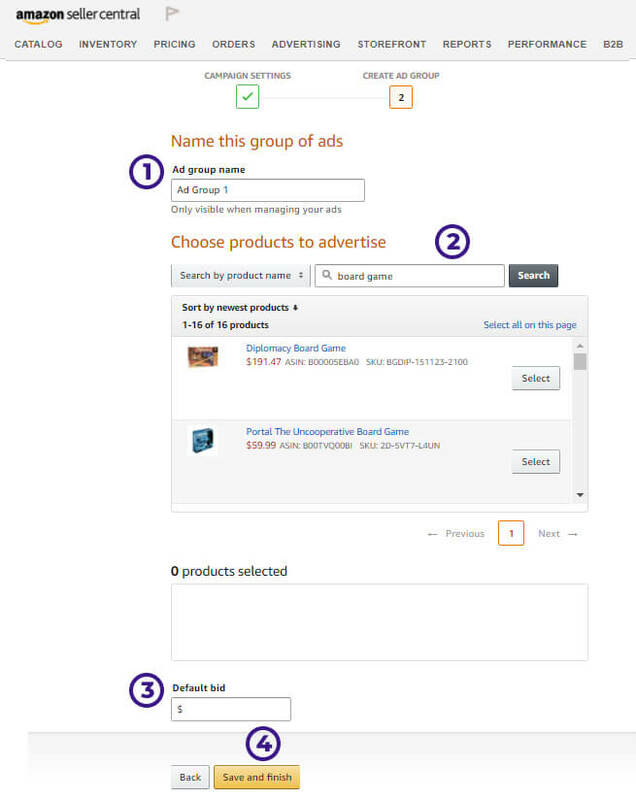 Also, advertising on Amazon with Amazon PPC lets Amazon’s search engine know that your product is relevant. Relevancy is one of the key factors that Amazon’s search engine uses to rank products. The higher your ranking, the more people see you. The more people see you, the more clicks you get. And the more clicks you get, the more sales you make. It’s that simple. Should I advertise my products on Google or Facebook instead? Amazon PPC is a much more efficient way to advertise products than on Google or Facebook. Of course, both Google and Facebook have huge audiences. As of this writing, Google is the #1 used website in the world. That’s right, not just #1 used search engine, but website. And Facebook ranks #2. So with that sort of traffic, it makes sense to advertise on those sites, right? However, the one thing that Amazon PPC has going for it is stronger buyer intent. When someone logs onto Amazon and starts searching, they’re probably in the market to buy something. This means that the chance of them buying your product after clicking on your Amazon PPC is a lot higher. We call this conversion rate. Most Amazon products see a conversion rate of 10-20%, which is nearly 10 times higher than the market average. On the other hand, when someone is on Google or Facebook, their intent may not be to purchase. On Google, they could just be looking for information and on Facebook they may not even be thinking about your product or others like it at all. Thus, you’ll spend a lot more in ads to make a sale, which cuts into the bottom line. Sales velocity. The more sales you make and the more profit you make, the better chance your product has of ranking on Amazon. Conversion rates and relevancy. If your product is getting more sales per clicks, then you’re telling Amazon’s search engine algorithm that your product is relevant. Amazon, like most search engines, wants to offer their customers the best possible customer experience, thus, it’s important that they offer relevant products. Variety. It’s not enough for Amazon to offer relevant, high-converting products on Amazon, but they want to give options, too. Of course, if nobody nobody knows about you, you’re not going to be able to demonstrate that your product is able to make more sales, has high conversion rates/relevancy, or that it’s different enough from the top sellers to be awarded a primo slot on that coveted first page. Volume is key to making money with Amazon. Remember, this isn’t like Ebay where you’re only selling a handful of products. Amazon FBA is helping you sell hundreds of products per month. This is super important, because when you’re selling products that are priced between $25-$50, the best way to make money with those products is by selling as many as you possibly can. And the easiest way to get your volume up is with Amazon PPC. Your friend’s bread knife set has a couple good reviews, some great product photos, and a low price at $19. But he’s not using ads. Still, he’s been getting 2 sales per day on average since he launched. After subtracting Amazon costs (15% + $4) and his cost-of-goods sold ($5), he’s earning $7.15 per unit, for a total of $14.30 per day. Meanwhile, your bread knife set (which also has some good reviews and photos) has a price of $29. You’ve got Amazon PPC running, and you’re making an average of 8 sales per day. The percentage of your price that you’re spending on ads (also known as ACoS) is about 25% of the purchase price. After subtracting Amazon’s costs and his cost-of-goods sold (same as your friend’s), you’re earning $9.40 or $75.20 per day. Now which sounds better to you? $429 or $2,256 per month? Every keyword or combination of keywords on Amazon has a different cost to it. Someone who’s selling wine glasses will have different keyword prices for terms like “wine glasses” and “glasses” than someone who’s selling baby towels who has “soft towel for baby” or “towels”. Your prices could be as low as $0.35 or as high as $5.00+ per click. There’s no one answer to what it will be. How are keyword costs calculated? Amazon PPC ads are based on bids made by you and your competitors. When you start a campaign, you’ll put in your target bid price. This bid price helps Amazon’s search engine place your product on the page. If you bid high enough, sometimes your product will be the first listing on the SERP. Bid too low, and your product may never show up at all, or if it does, it’s 5-6 pages deep, definitely not where you want to be. 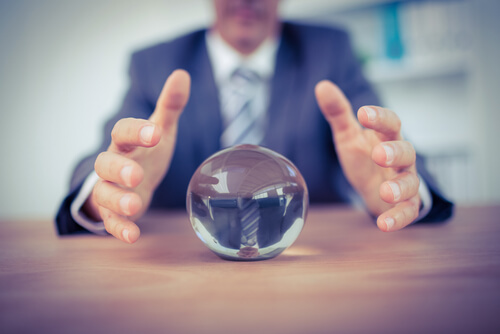 Having said that, there are a couple ways that you can get close to predicting what your advertising costs will be. 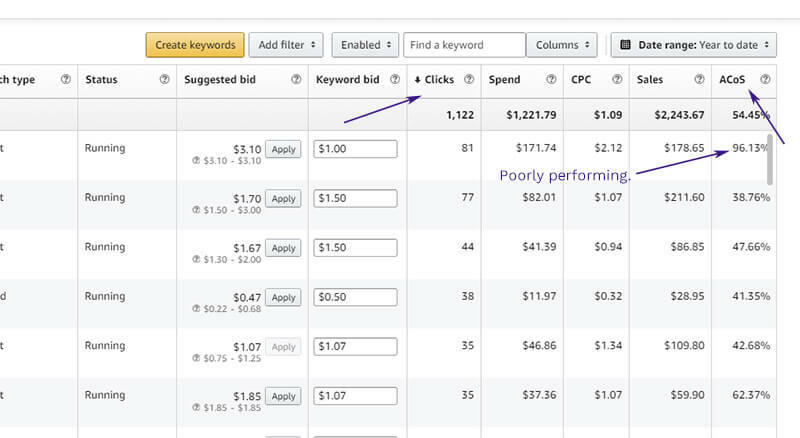 How to predict Amazon PPC costs in advance. Unfortunately, until you’ve actually got the product up and live on Amazon, there’s no way to accurately predict what your costs will be. But there are some tricks that can help. There’s a couple recommendations we have for predicting your Amazon PPC costs. One of the best ways you can protect yourself against the cost of keywords is by having a product that has high-demand and low competition. Remember, the more competition there is, the higher the bids for keywords will be. Give yourself a healthy margin. If you try to launch a product priced at $13 and you have Amazon costs of $5 and a cost-of-goods sold of $2, that only leaves you $7 to split between Amazon PPC ads and your profits. If it turns out that your keywords cost even $0.70 per click and your conversion rate is 10%, then that’s your entire profit margin right there. Inversely, if you price your product at $25, that leaves you $16.25 for ads and profit. Create a product listing on Amazon. It doesn’t have to be perfect yet, but good enough to launch on Amazon, so you’ll probably need at least one product photo and a description. You don’t even really have to send it to an Amazon FC, either. If it sells, you can ship it yourself. Make sure to optimize your title. We’ll probably discuss this more during the Genius Series, but be sure that your product title is relevant to what you’re selling and the keywords you’re trying to rank for. Turn on an auto and a manual campaign. You’ll want to use Amazon’s automatic targeting to see what words they use to sell your product and then the manual to test out some of your own long tail keywords. Focus on long tail over short head. Long tail keywords are those that have more than one or two words. They are usually more specific in intent than short head keywords. But for that reason, the costs are also less than short head. This method of keyword bidding is based on Long Tail Theory. A lot of people ask us, “Why not just sell on Ebay?” One of our writers, Dave Hamrick, has a little experience with that selling books. Check out the article here: Is it better to sell on Ebay or Amazon? What is long tail theory? Long tail theory is the idea that popular, generic keywords (short head) that get more searches do not provide nearly as much value as those with more specific requests (long tail). 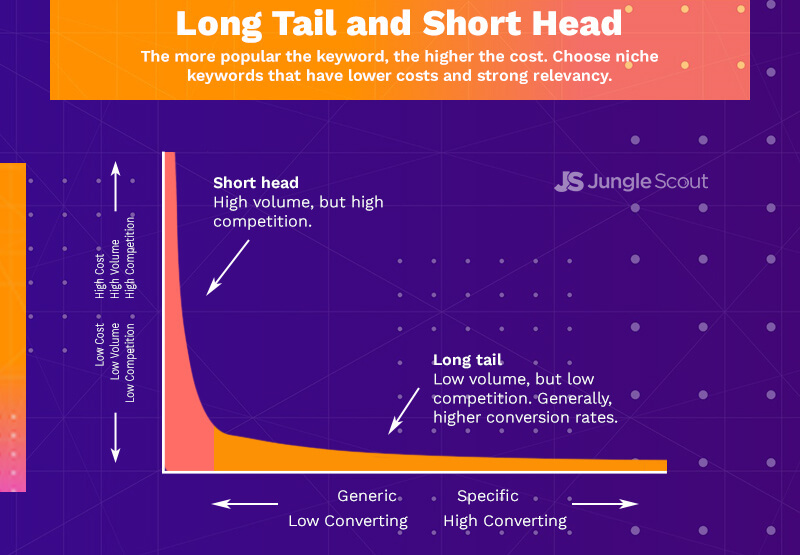 Not only are the costs less on long tail keywords, but the conversion rates tend to be higher, too. For example, if you’re selling a bread knife kit, you might spend $2-$3 per click to get to the front page of the “bread knife” search result. You’ll get a lot of impressions and clicks using “bread knife”, but your conversion rates may be slower and you’ll ultimately end up spending more. On the other hand, if you focus on long tail terms “long handle stainless steel bread knife kit” or “bread knife kit for home kitchen” your conversion rates will be higher and your keyword costs will be lower. It might take a few more long tail keywords to get the sales you need, but in the end, research on long tail keywords is what will help you win more sales and reduce your ad cost percentage (ACoS). How does payment for Amazon PPC work? Amazon ads up all of your costs for Amazon PPC ads and charges you when your ad spend reaches a certain threshold, typically $500. Additionally, they will take out ad costs once per month, typically around the first of the month. The costs for ads can come out of the checking account you gave Amazon when you registered your seller account, or it can come out from your escrow funds, those that Amazon has yet to pay you. Here’s the method that I’ve used for years (making tweaks as necessary, of course) that’s done pretty well for me. Hopefully, you can adopt some of these strategies for your own Amazon PPC strategy. Create an automatic ad campaign. Let your automatic ad campaign run for a week. Generate a keyword search terms report. 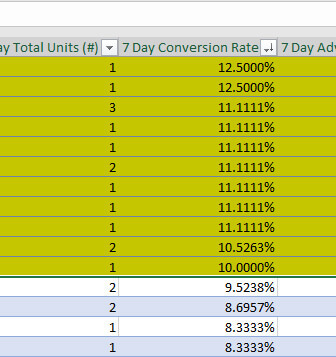 Sort the report by the highest converting keyword terms. Brainstorm long tail keywords from the best keywords. Start a manual ad campaign. Input the keywords you came up with into the manual campaign. Run another report and look at the results. Once your product is up and running and you’ve shipped a few promos to boost ranking and visibility, you’ll want to turn on an Automatic ad campaign. 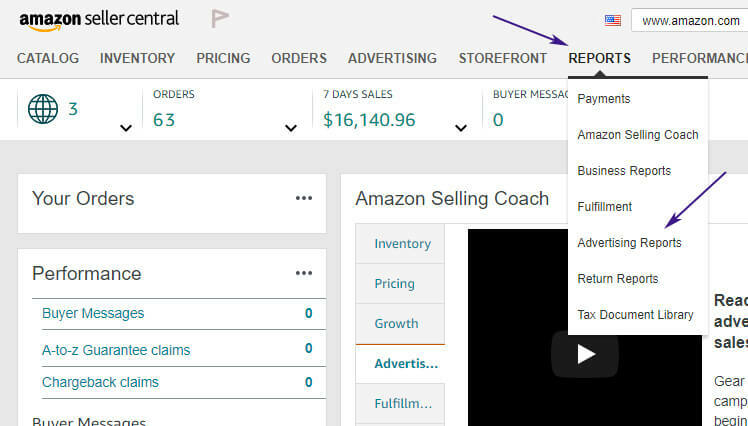 First, log in to your Seller Central and go to the Advertising drop down menu. Select campaign manager. When the campaign manager pops up, click the big, yellow “Create campaign” button. On the campaign settings screen, enter in the requested information. Campaign name. This can be whatever you want it to be, but should probably reflect the product that you’re advertising to make it easier to read later on. Daily budget. This is the maximum amount that you’re willing to spend in a day. I recommend doing $25, but if you’re comfortable with more (or want to do less), by all means. Start date/end date. You don’t really have to set this up, but if you want to protect yourself from spending too much, you can set this 7-days out. Click continue to next step. Next, comes the create ad group screen. Ad group name. Again, this can be whatever. Pick something relevant to your product or give it a number you’ll recognize. Choose products to advertise. Pick the product that you want to promote. Default bid. When your product is clicked on, this is the amount that you’re willing to spend. Amazon will suggest a value for you. I usually start mine with $1.50-$2.00. Congrats, your ad campaign is now running! You’ll probably go nuts over how your ad campaign is doing. Trust me, I’m the same way. I obsess over my products. But I’ve also learned that a watched pot never boils. Furthermore, you’re going to want as much data as possible, and you can’t get that after only 1-2 days. Just sit back, relax, and let Amazon do their thing with your ad. Once your campaign has been running for a week, it’s time to see how well your campaign did. Head back to Seller Central and click the Reports menu. Then select “advertising reports” from the drop down. Click on the “Create Report” button. Your report should instantly appear in the saved reports grid below. Hit download. 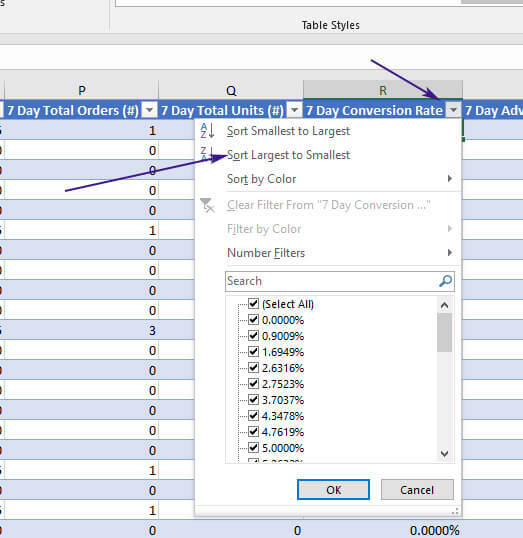 Once it downloads, you’ll have an Excel document with all the keywords people used when they clicked on your product. Open up the Excel file that the keyword search terms report created. All of the data will appear, but it won’t be organized. You’ll have to organize it. With your mouse, select all the data. 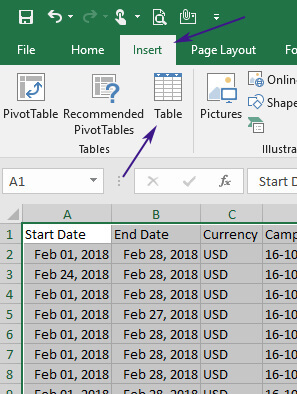 After you’ve selected the data, click the insert menu tab and then click the Table button. 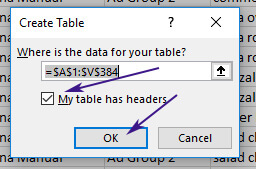 Make sure the “my table has headers” check box is selected and hit OK.
Now all of your data should be in an easily customizable table. This puts all of the winning keywords into order by conversion rate. This is important because Amazon bases their ranking on conversion and relevancy above all other things. From there, highlight the keywords that convert the best. I usually target the keywords that convert at least 10% or better, but if your product is a high priced product, you might want to pick a lower rate. Note: you might have a few keywords that look like odd combinations of letters and numbers such as B00E3E329A. These are ASINs, and you can ignore these, as you won’t be able to manually target ASINs with Amazon PPC. How to come up with more keywords for Amazon. Regardless of what those keywords cost you (chances are clicks were pretty high), you now can start coming up with long tail keywords. You’ll want to come up with 10-20 long tail keyword phrases per topic. There’s a couple you can do this. KWFinder.com. Just put in the keyword and it’ll give you ideas on what people search on Google. Not all are winners, but many are good. Keyword.io. Another search engine tool, this one actually has an Amazon search engine checker. Sellerwords.com. Here’s another powerful Amazon keyword search tool, and this one actually lets you put in an ASIN and do a reverse lookup on your competitors. Google Keyword Planner. Another reverse lookup tool, with the keyword planner you throw in the URL to the page and Google will spit out ideas and how high the search volume is for it. Make sure to put all of your ideas in a document like notepad so you can easily cut and paste it into a new advertising campaign. Okay, now this is where the fun starts. It’s time to start an Amazon PPC manual campaign. 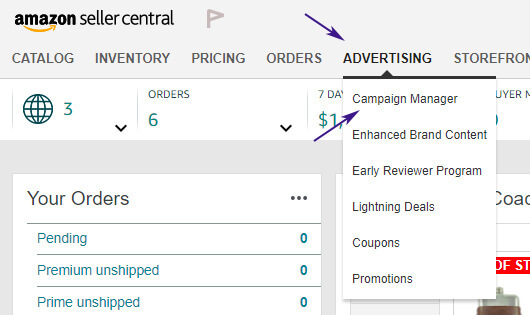 Head back to Seller Central, click on Advertisements and select Campaign Manager again. Then, hit Create Campaign once more. On the campaign settings page, put in $25 for your budget again (or whatever you picked before), but this time, for targeting type, select “Manual targeting” instead of Automatic. Then, when you create an ad group, pick the same product. Set your default bid at the rate you’re comfortable at (I still go for $1.50 – $2.00). You might also notice a new button labeled “Bid+.” Don’t worry about that one right now, but essentially it increases your bid up to 50% more than the default if there’s a chance you’ll rank on the first page. The one big difference between an automatic campaign and a manual campaign is that you get to input the keywords. On the first box, Amazon will suggest a bunch of keywords that they think are relevant to your listing. This is based on the description you gave your product as well as the title, plus the results of any automatic campaigns attached to that keyword. Feel free to use as many of those as you like. After inputing Amazon’s suggested keywords, click on the “Provide your own keywords” tab. Here’s where you will cut and paste all of the high-converting topical keywords and long tail keywords that you came up with from your search terms report. On the side, there is a box that gives you “Match type.” The match types are Broad, Phrase, and Exact. Here’s what each of those mean. 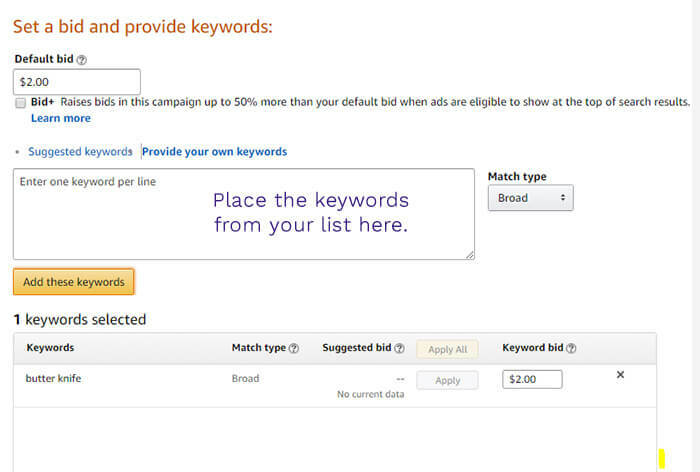 Broad, Phrase, and Exact: What do these Amazon PPC Match Types mean? Broad. This lets Amazon use your search term to bid not only on the search term itself, but helps you bid on related search terms. This might include synonyms, misspellings, and variations. So if you put in “bread knife”, Amazon will give you bread knife results, but might also place your ads with “knife set”, “bread slicer”, and other items it thinks might be relevant. Phrase. Phrase matches are similar to broad in that it connects your keyword phrase to search terms related to the terms you input. However, the main difference is that Amazon will more or less keep the order of the words in the phrase. Related terms will come before and after the phrase. For example, if you put in “bread knife” for the phrase, it’ll come back with “steel bread knife” or “bread knife with box” but never split up the words “bread” and “knife.” This still accounts for synonyms, misspellings, and variations. With each Match type, you get more and more specific. I usually start my campaigns with broad matches and then as I get more data, I switch to Phrase. Only after I have a few months worth of data will I switch to Exact. Run another report and generate more keywords. After another week goes by, run your report again. This time, you’ll have results for your manually targeted keywords. Just use the exact same sorting strategy as before to come up with even better long tail keywords based on the new data. Now that your ads have been running for a couple weeks, go back to Seller Central > Advertising > Campaign manager, and open up your manual targeted ad campaign > your ad group. Click on the keywords tab. Input any new keywords into “provide your own keywords” tab. Then, examine your list of keywords that have been running for the last week or so. I usually organize these by “clicks” to see which keywords are getting the most attention. Now that I’ve got those organized how I like, I see what’s converting well and what’s doing lousy. The best way to determine this is with the ACoS column. If ACoS is low, that means that particular keyword is converting well. From there, I might up the bid, especially if it’s 15% or lower. If the ACoS is high, I’ll adjust down my keyword prices (usually by $0.10 to $0.25) or just pause it. Finally, I’ll look through the keywords that have had 20 or more clicks and haven’t made a sale yet and totally remove those from the list. There’s no point in keeping a keyword if it can’t convert even after 20 clicks. You’re just throwing away money at that point. Feel free to set your own standards. With automatic targeting, there’s not much you can do change things up with what’s getting bid on other than bring the default bid value up and down. Once manual campaigns are running, you may want to change that bid so it’s not competing with your manual ad campaign. I won’t totally get rid of my automatic campaigns, but will slowly diminish them by $0.25 or so until the average cost-per-click is less than my lowest manual targeted keyword bid. So this concludes our look into Amazon PPC and the strategies involved. While the costs and metrics for your own products may end up being totally different than what I showed you, the point I want to get across is that you’ve got to experiment and you’ve got to be patient. It usually takes at least 60 days for your Amazon PCP campaigns to get to the point where they’re converting well and your costs are manageable. Try to force it and you could end up spending way too much money. And if you just give up without checking the data and making necessary adjustments, you could miss out on a ton of sales. Next week, we’re giving the series back over to Dave Hamrick. He’ll go over some advanced marketing strategies including using Kickstarter to launch new products and building marketing funnels. This has to be one of the best articles explaining Amazon ads/ppc with great images to help readers understand better! Great job! One question that has always been bothering me and hope you can help explain. On the long tail vs. short tail example you gave “bread knife” is short tail that gets lots of impressions but low conversion versus longtail which is “long handle stainless steel bread knife kit” or “bread knife kit for home kitchen” for targeted, specific and yields higher conversions. If I’m setting up a “bread knife” and using broad or phrase match..won’t it also pick up the long tail search words that include the words “bread” and “knife” already? Is there any special way to setup a long tail keyword in amazon to avoid the broad search picking it up already? Great question. And yes it will. To avoid picking up the long tail stuff, set it as exact. You’ll have to put more in there, but in the end, it’s worth the time and saves you a lot of money. Thank you sir. Do you know if Amazon has any priority structure when going thru campaigns? Meaning If I put Exact longtail phrase “bread knife for home kitchen” and then another campaign for “bread knife” Broad phrase. Is one picked first versus the other? As far as I know it will always select Exact over Broad. You might run a test or two and then run some reports to see which is getting more clicks. This is great with regards to the auto and manual campaign with broad match keywords. Where can I get help on the process of determining good exact match keywords? Do you just take high performing broad match keywords and move them to exact match keywords? Or do you look at the customer search terms in your advertising report and use those? Personally, I look for keywords that have a good price relative to the search volume. 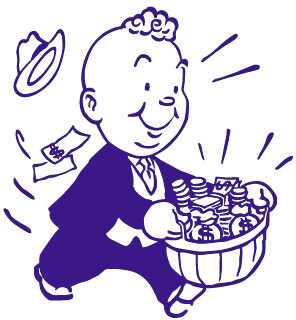 Then I multiply the PPC cost by 40 to come up with a sales price. If the sales price is reasonable (within 20% of other product prices in the category) that usually tells me it’s a good keyword to go after. My question is why the fact that one of them is using ppc makes him be able to sell for a much higher price and also gain 4x sales, this sounds kind of non sense. I’ve been struggling to find a product with healthy margins, my product is a bundle which i have 20~25% profit margin (depending what i price it) but I think it is not reasonal to price it above a certain price since compared to other sellers it would be higher than them all. Hope that is somewhat clear. Typically, you can compete on a price that’s within 20-25% of the average sales price for a product. And while it’s possible to sell products at higher prices, sometimes it does make your conversion rate go down. Regardless, you should never try to compete on price unless you’re in a very fresh market. These are excellent tips on using Amazon PPC, except there’s one problem. Amazon doesn’t display my product page as a search result ever for any of my search phrases, even though I bid higher than anyone else (and the phrases are relevant). Amazon told me that it is because I don’t have the “Buy Box”, so I can’t advertise. There is no buy box on the product page of this new product that my company manufactures, even though I am a seller (the only seller, by definition). Amazon tells me that the algorithms decide whether a buy box is created, and they can’t do anything about it, although they say I might try lowering the offering price, to fool the algorithms, which seems absurd. (Didn’t work). Any suggestions on how to get a Buy Box assigned so the ads will start running? Interesting conundrum. Are you selling your product much higher than competitors? Or too low? That might be the reason there’s no Buy Box. The product (anti-odor shoe inserts) is new and is manufactured by me (ie., my Co.) and only sold by me. The price I charge is about the same per pair as other products with the same intended use. That’s subjective to your budget, of course. I recommend starting out slow, with a budget no more of $50-$70 per day, and frequently checking your results. I launched my product 15 days back and not running any PPC. i got 5 sales and 2 good reviews. But i got a feedback that my main image needs to be improved. so i hired someone from jungle market. She will deliver me in next 4 -5 days. My question is shall i wait for enhanced image to start PPC or i can start one right away? Thank you for your awesome content about Amazon PPC. This can help me a lot to improve Amazon PPC set up for my product. I try to apply the provided code in Udemy and found that the code is expired. Do you have any new code to enable me to apply on Udemy. Can someone please help me understand the relationship between the daily budget and the bid (pay per click) for keywords? I understand what the bid does but how does it relate to the daily budget? If it doesn’t then what role does the daily budget play? Your bid is the most you are willing to spend per individual click. The day budget is the total sum of all those clicks you’re willing to spend in a day. A customer wants to buy a garlic press. They type in “garlic press” on the search. You and three other sellers (A, B, and C) are all using ads for your respective garlic presses. You are bidding a max of $0.50. None of you have run out of your budgets yet. They click on your ad. That click costs you $0.50. 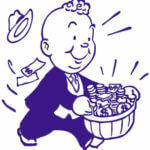 If Seller D’s ad had been clicked, they would not have had to pay the full $0.75, but only enough to beat out your bids. You have a total daily budget of $10.00. So after 20 clicks like this, you use up your entire budget for that day and won’t get another click until 12am PST the next day. At that point, your ad stops appearing in the Amazon search results. This is kind of a simplified way of explaining it, but that’s more or less how it works. Hello guys, great info. I was wondering if there’s a book on Amazon that explains in depth all different aspects of Amazon’s SEO (CTR ACOS etc). An updated one I assume as Amazon’s SEO improves from time to time. Thank you for the awesome content!!! I have a product that runs 3 months and make an average of 3 sales per day, without PPC campaign and with only 6 reviews. This product is located number one in the first page, right after the sponsored products. The product price is around $35, has a well built product page including good photos and even an EBC description. My question is whether I need the PPC to get more sales and if yes, how to start taking into account that my product leads the first page. I want to increase my sales but I don’t want to just throw money or do mistakes. I have a total of three FBA products and also JS programs (Chrome Extension and Web App). Congrats on getting the first page! You may have conquered your targeted niche, so you might consider branching out into adjacent markets. For example, you could be winning the keyword “garlic press”, but still be behind in “garlic mashing tool”, etc. If that makes sense? Use the lean testing method to make sure that you’re not needlessly throwing money away. Very useful content. I have been wasting away money doing my own thing on amazon PPC and will be changing this now and following the process above. Glad to hear you’re doing better! The research phase is probably the most important phase in the whole process. When done right, it accounts for 80% of your profits. If you haven’t already, start with the Chrome Extension and start looking for products that have high-demand (sales) and low competition (reviews). We suggest looking for products that sell 200-300 units per month where the top sellers have ideally less than 100 reviews. Even if it takes you a while to find the right product, don’t skim over this part of the process. From there, the rest is easy. I like how thoroughly you explained it!